Cash for clunkers: One of the few bright spots in a dismal sales year. The economic upheaval of 2009 confounded expectations and left crystal balls fogged up. Here are 10 automotive-related predictions, usually from supposed experts, that didn't come true. 1. Toyota will post profits of $557 million for the fiscal year ending March 31, 2009. Toyota was red-faced when it posted quarterly losses of $1.5 billion for the quarter that ended Dec. 31, 2008. But it vowed to close its fiscal year just three months later with $557 million in net profits. Things proved worse than imagined. Fiscal year-end results: losses of $4.4 billion. 2. A Chapter 11 bankruptcy at General Motors will lead to its liquidation. It's hard to say whether GM CEO Rick Wagoner believed his comments that a controlled GM bankruptcy was impossible, or whether he was bluffing to get the Bush White House to pony up more cash to stave off bankruptcy. In one regard he was right: The bankruptcy did lead to his own liquidation as CEO. 3. As many as 2,500 car dealerships will close in 2009. A widely cited market report from the consulting firm Grant Thornton LLP correctly envisioned a troubling year for U.S. retailers. But 2,500 closings? Not. 4. The "smell of death" will keep people away from showrooms. CNW Marketing Research of Bandon, Ore., produced data showing that consumers were leery of bankrupt car companies; and Mark LaNeve, GM's head of North American sales, blamed a late-2008 sales decline on all the public chatter about bankruptcy. But after its headline-making bankruptcy filing on June 1, GM sales dipped 33 percent for the month. Toyota, which did not file for bankruptcy, dipped by nearly the same percentage. GM's sales for the second quarter -- including the month of its bankruptcy -- were higher than its first-quarter sales. 5. Bankruptcy at GM and Chrysler will trigger catastrophic business failure at hundreds of large and small North American parts companies. The widely embraced manufacturing Domino Theory sounded eerily plausible in the dark first quarter. But survival proved to be the norm among suppliers. Many used the opportunity to reduce costs, restructure work forces and make themselves more competitive. Go figure. 6. 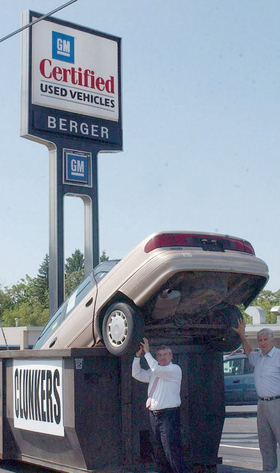 The cash-for-clunkers program will be a "nonevent, a huge missed opportunity." So said Jeremy Anwyl, CEO of Edmunds.com, predicting that the program would boost sales only 7 percent at best. To be sure, that was before Congress opened its wallet wider. 7. Foreign-made cars will begin showing up in Saturn showrooms as early as the summer of 2010. Industry icon Roger Penske told the media he was talking to automakers around the world about creating a product portfolio to support his takeover of Saturn. But after France's Renault declined to play, Penske folded, and Saturn dealers learned the brand will no longer even exist in the summer of 2010. 8. Volkswagen's global sales will fall by 10 percent. Maybe VW AG CEO Martin Winterkorn was trying to be gracious when he started the year off saying that VW would suffer right along with the rest of the world's automakers in 2009. But by the end of November, VW group sales for 2009 were up 6 percent. 9. Porsche will take control of Volkswagen. Porsche's aggressive chess master Wendelin Wiedeking predicted a smooth 2009 takeover of his mammoth cousin company, Volkswagen. But VW did not humor him -- or invite him to stay after it acquired Porsche. 10. The economic crisis will leave only six major automakers by the end of 2010. Fiat boss Sergio Marchionne still has a year left to see his gloomy prediction pan out. But so far, brands may be disappearing, but not companies.